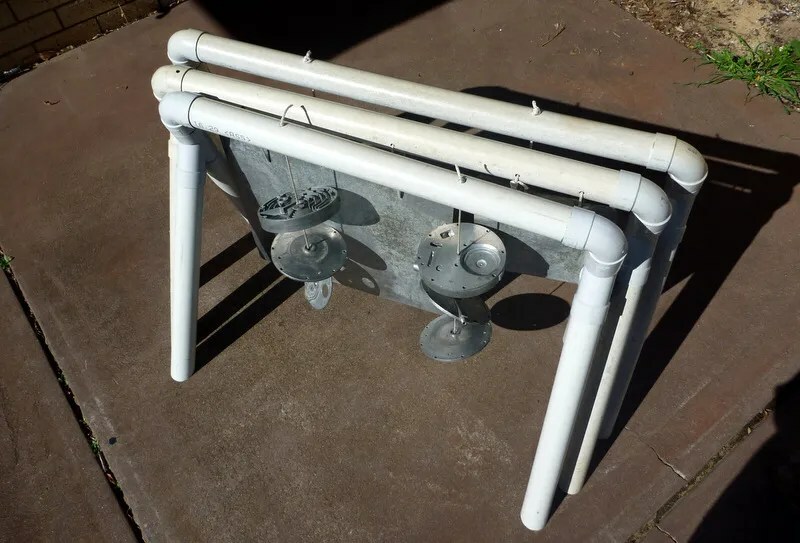 In my last blog post I walked you through selecting scrap metal for making musical instruments; now it’s time to show you how I built a strong and easy to build PVC frame and turned some scrap aluminium castings into a bell tree. 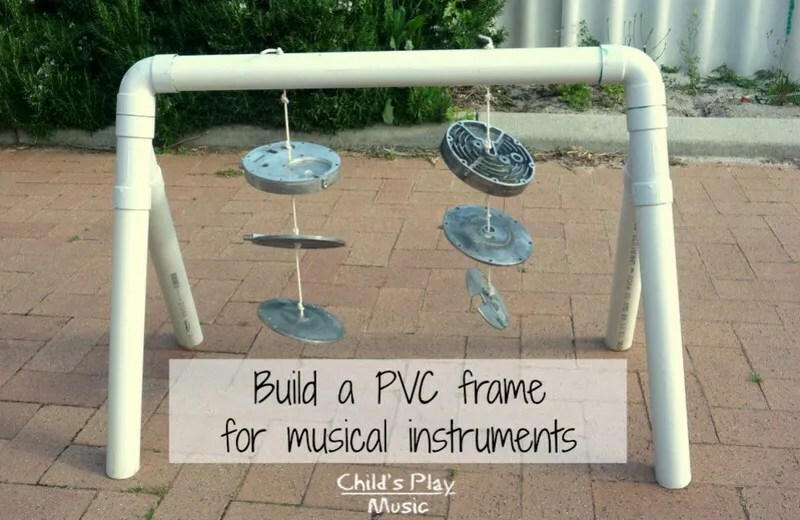 I use these instruments in my Child’s Play Music hands-on play-based music incursions with young children in all kinds of Early Childhood Education settings here in Perth. 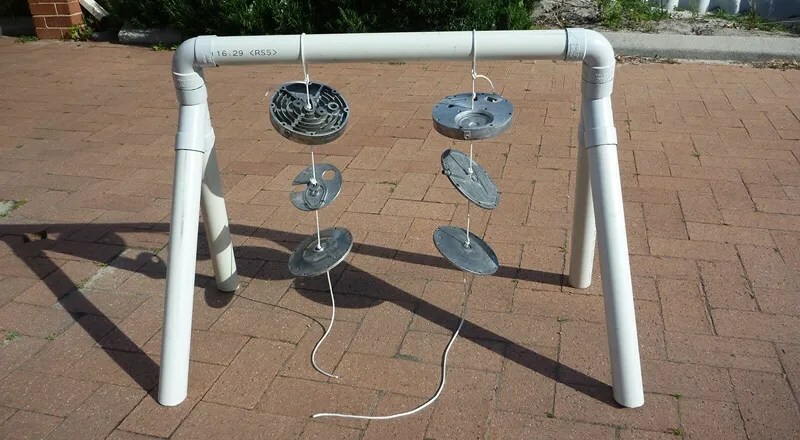 You can use this frame design for many different instruments – even for hanging old pots and pans. 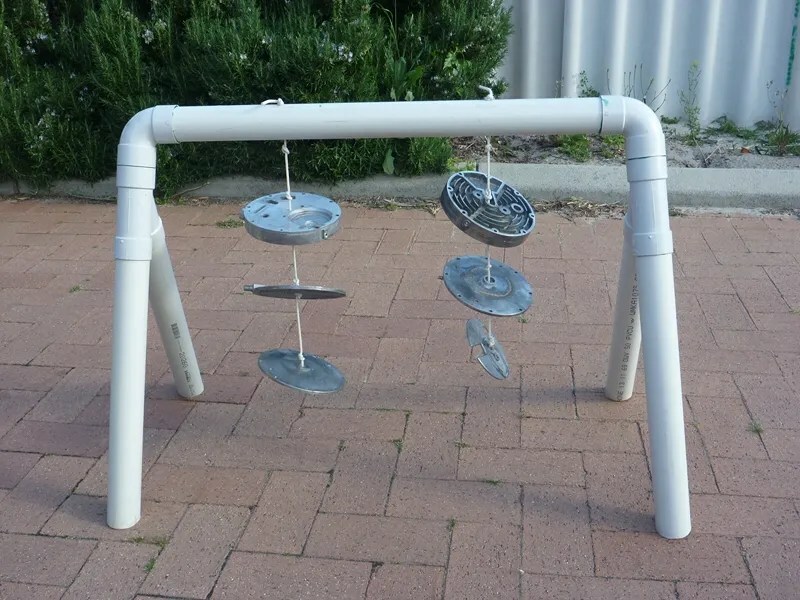 I have 3 frames: for my stainless steel cymbals, my aluminium gongs, and now this one for my aluminium castings bell tree. Test hanging the castings – just tie an overhand knot above and below each casting. No problems – I’m not looking for perfection – all I need is another frame and with two cords and six castings I’ve got an interesting and unusual instrument rather like a bell tree. 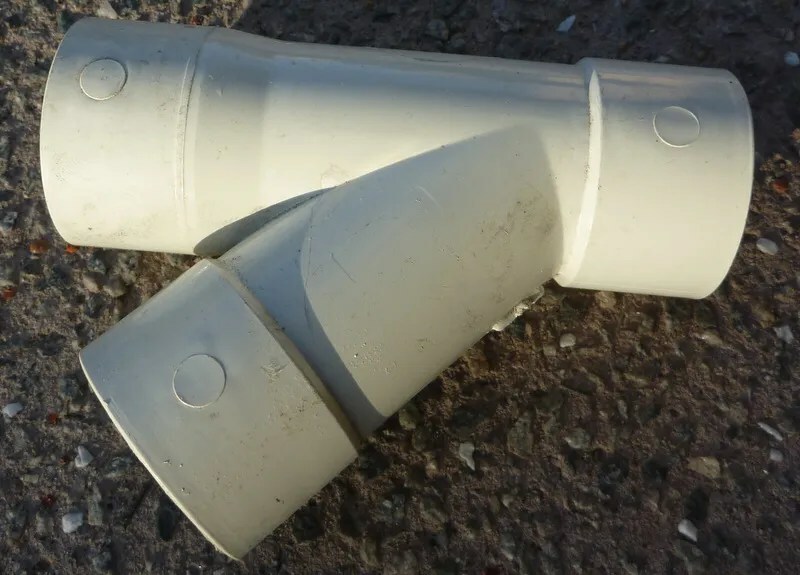 uPVC is so easy to work with, it’s very safe, it’s recyclable, and remarkably strong if you choose the right pipe. I’ve already built two of these frames so I knew exactly how to build the frame. With this design you get a very stable frame – safety is very important when you work with children as young as I do. I use DWV pipe, used for drainage and sewerage – it’s not pressure pipe, and that makes it cheaper. It comes in various diameters; find it at major hardware stores or plumbing supply companies. In countries other than Australia you will find very similar pipe cheaply available, but dimensions may vary. The pipe I use is nominally 50mm diameter; it’s actually just a little larger than 50mm. Wall thickness is 2.2mm. It’s relatively inexpensive – around A$25 for 6 metres, a bit more if you are buying by the metre. I like to use recycled materials whenever I can but for DWV I make an exception. Clearly you don’t want to use recycled pipe that may have been used for sewerage (yuck! ), and the fittings are not reusable once they have been glued. Throughout this project I use metric measurements. If you are used to feet and inches, 50mm = ~2 inches; 2.2mm = ~0.09 inch. For the lengths of the frame components a handy length converter can be found here. 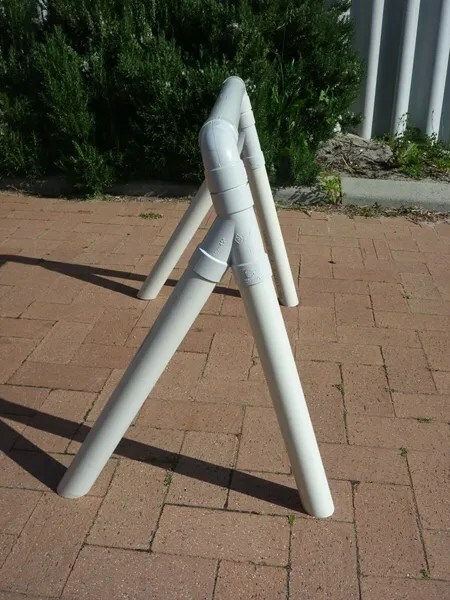 This is a very quick and easy project – I’ve given complete instructions below, but if you are familiar with using PVC pipe you can probably just look at the next image and know exactly how to build this frame. 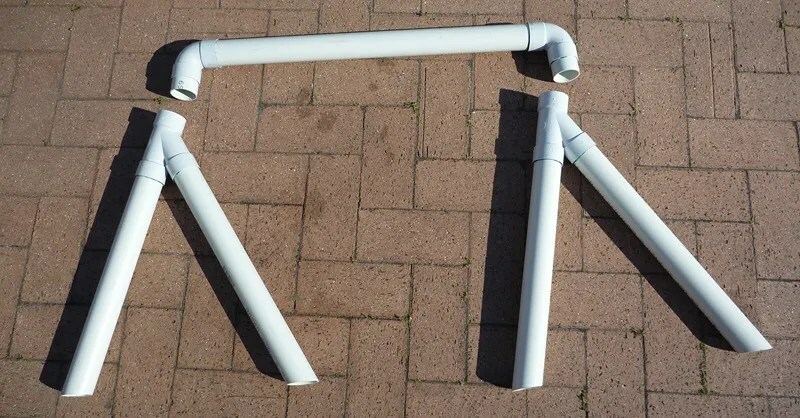 Frame components ready for assembly – note that the pair of legs on the right have not yet had the angles cut in their bottom ends. That’s a tenon saw; if you don’t have one a hacksaw will do. When cutting PVC pipe it’s a good idea to wear a dust mask and safety goggles. The dust is not toxic but it can irritate eyes and lungs. Hold the pipe firmly when cutting; if necessary get someone to hold the pipe while you cut. 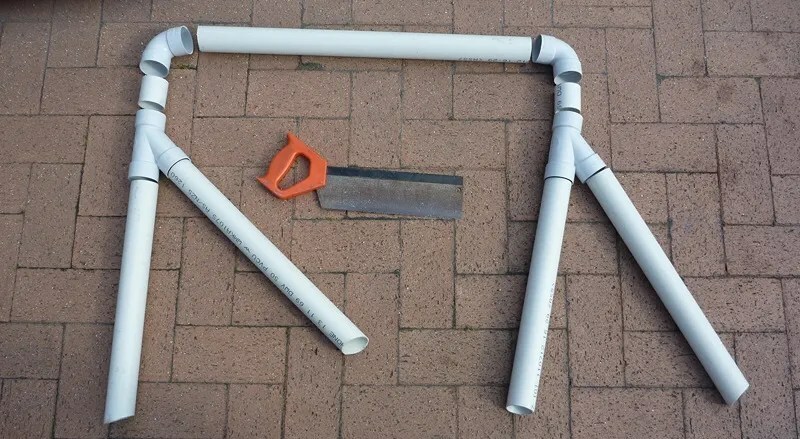 Try to cut the pipe square, but if your angles are a little out it’s not a problem. Always double-check your measurements before cutting! Test assemble the frame. Do not glue it together yet. 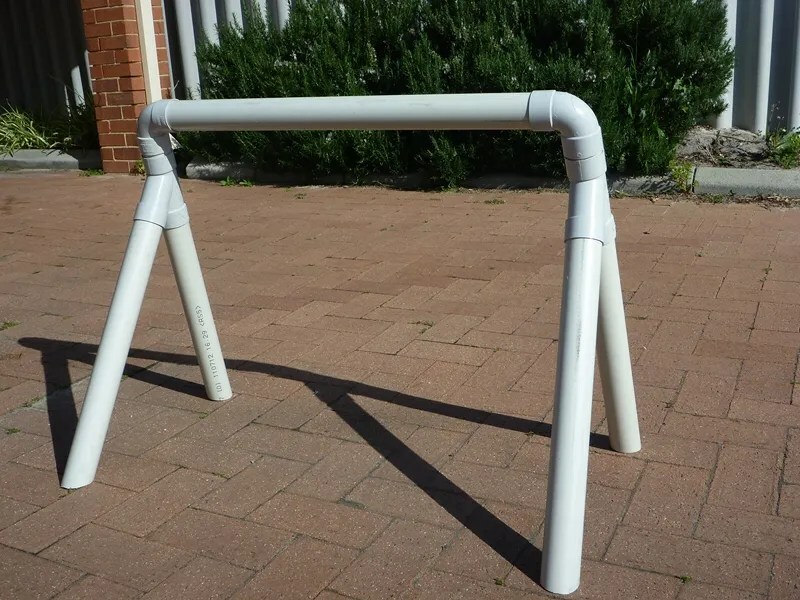 There is no way to un-glue PVC! With the frame still assembled eyeball where you need to cut each leg to get it to sit level. It will be around 20mm from the end, but check for yourself. Mark this point with your pencil. In the image above you can see why I’ve made the legs different lengths: because the left leg is slightly longer than the right the horizontal top bar is over the mid-point of the two legs. This provides maximum stability. Once you are happy with how it’s sitting it’s time to glue the frame together. Do all gluing in the open air – the glue stinks! Avoid breathing the fumes. 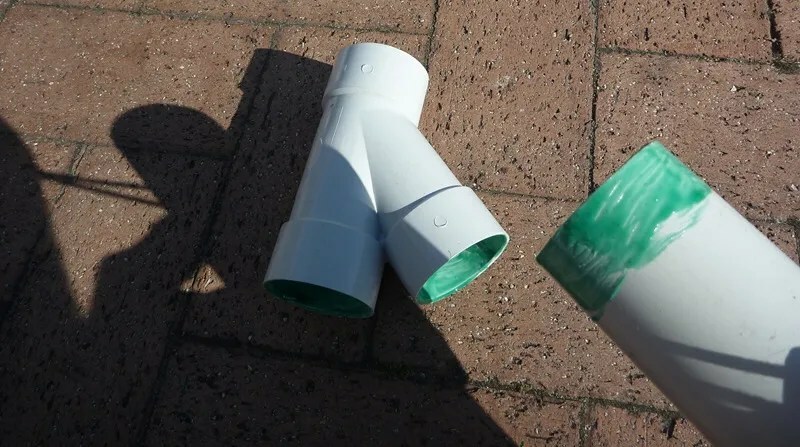 Apply glue to both the inside of each socket and the outside of the pipe to be glued. Work quickly – you’ve only got a couple of minutes before the glue sets. Make sure that when inserting pipe into sockets that you seat the pipe all the way into the socket. Glue a short 70mm section into each elbow. Glue the elbows on to the top bar. Make sure the elbows are in line with each other. Make sure to adjust the legs so the angled ends will sit flat and square. Both sets of legs glued and ready to attach to the top bar – note how the angled leg ends are aligned with each other. Glue and insert the first pair of legs. It’s important to make sure the legs are perpendicular to the top bar. With the gluing complete, leave the frame for an hour or so while the glue cures. Maximum bond strength is reached after ~24 hours. Seal the ends of the ropes by lightly melting them with the matches or lighter. Avoid breathing any fumes. The melted ends are hot and can burn you, so wait for them to cool. That looks about right! Note there are knots above and below the objects. I wanted the two ropes to be an equal distance from each other and from the legs so they would be unlikely to bang into each other when struck. Depending on your objects you might have room for more ropes – you could probably hang up to 8 objects on 4 ropes by staggering the objects vertically. Mark the position of the ropes with the pencil. Remove the ropes. Drill 6mm holes vertically through both walls of the pipe. You may want to drill a pilot hole with the 2mm drill bit as this makes the drilling more accurate and much quicker. Insert the rope through the holes and tie off above the pipe with a simple overhand knot. Trim off any excess rope and reseal the ends by melting them to prevent fraying. And that’s it: all done! For these castings I found the best-sounding beater was white nylon rod – like the handles of nylon kitchen mixing spoons. For other instruments you might use hardwood dowel, metal rods, or soft ended beaters. It sounds like thin high-pitched bells, with quite a long sustain. I’ve made no attempt to tune it to a scale, but to my ears it sounds rather like a Balinese gamelan instrument. 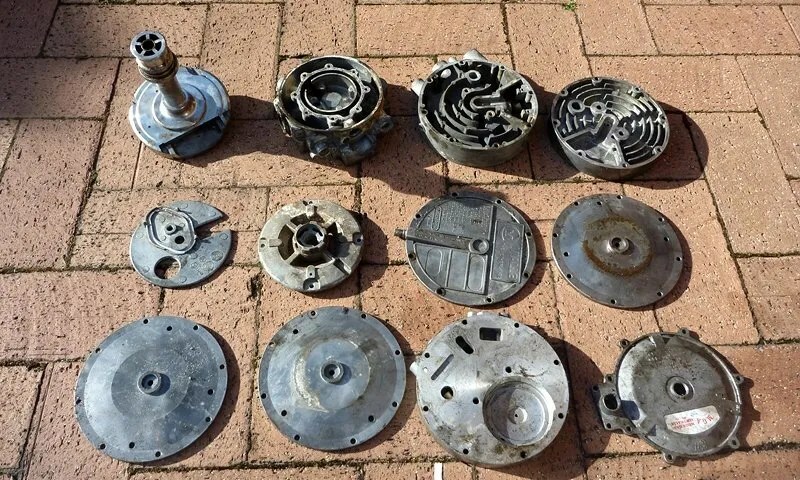 Check out this brief video – with bonus aluminium gongs! For gongs and similar instruments drill the holes horizontally in the top bar. 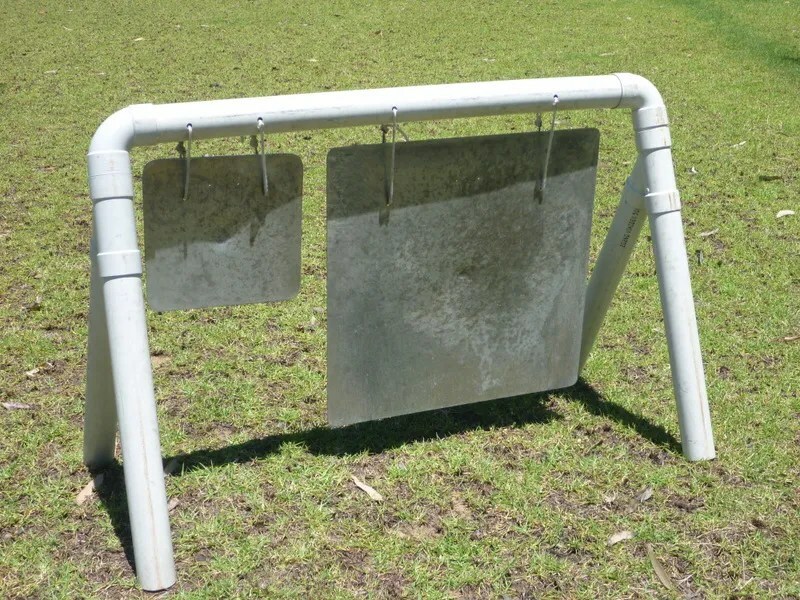 These instrument frames stand approximately 680mm tall and are designed to be played by small children kneeling or squatting down. 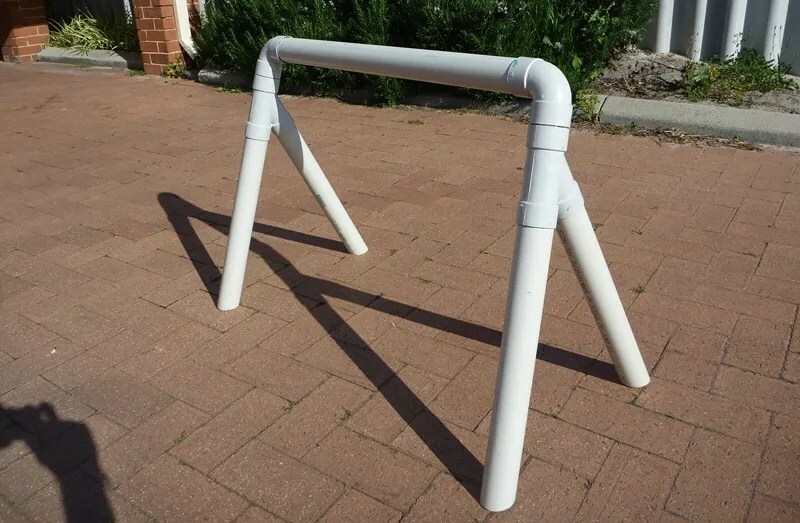 You could easily make a much taller version by lengthening the legs, but you would probably need a horizontal triangulating brace connecting the ends of each pair of legs for added rigidity. I wouldn’t make the top bar any longer than ~1 metre, although you could do so by using thicker walled or larger diameter pipe. This would greatly increase the price, so you are probably better off just building more frames. uPVC is a very safe material. 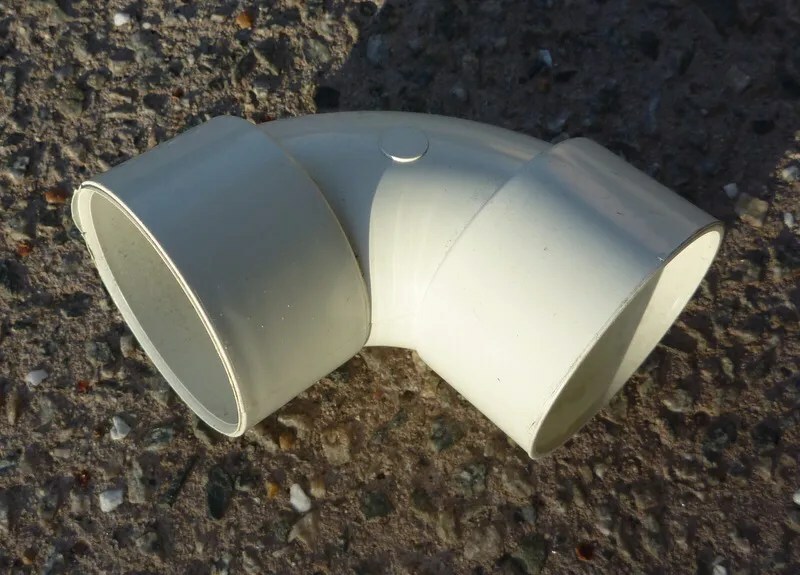 It contains no plasticisers or pthalates, and is so safe, non-toxic and inert that it is the material of choice for carrying drinking water: almost all new installations of water mains and cold-water house plumbing are uPVC. uPVC can be recycled at the end of its lifespan. You may be wondering why the castings produce different pitches. It’s all about the physics of vibrating bodies: any object that vibrates has a “resonant frequency”, the speed (in cycles per second) that it vibrates at when struck. If the resonant frequency is low it will vibrate slowly and will produce a low pitch; if the resonant frequency is high it will vibrate quickly and produce a high pitch. So what is it that determines an object’s resonant frequency? It is a function of two inter-related components, stiffness and mass. The stiffer the material the higher the pitch, and the greater the mass of the object the lower the pitch. Think of guitar strings: the high strings are made of thinner wire, so they have less mass and vibrate more quickly than the thick bass strings (at the same tension). And when you tighten a guitar string by turning the tuner you are making the string stiffer, so it raises the pitch. The actual pitch you hear will be a function of both the mass and the stiffness. So if you change either mass or stiffness (or both) you will change the resonant frequency of the object, it will vibrate either faster or slower, and you will hear either a higher or a lower pitch. Now for these castings it is a bit less obvious. Looking at the photos you can see that the top castings are very thick, and obviously much more massive than the other castings which are quite thin and light. Yet these very thick, massive castings produce a higher pitch than most of the thin light castings. This seems odd: didn’t I just say that greater mass equals deeper pitch? Yes indeed! But in this case it is the stiffness of the castings that has the greatest effect on the pitch, and the thick massive castings are very stiff indeed. And since they are very stiff they produce much higher pitches than most of the more flexible thin light castings. 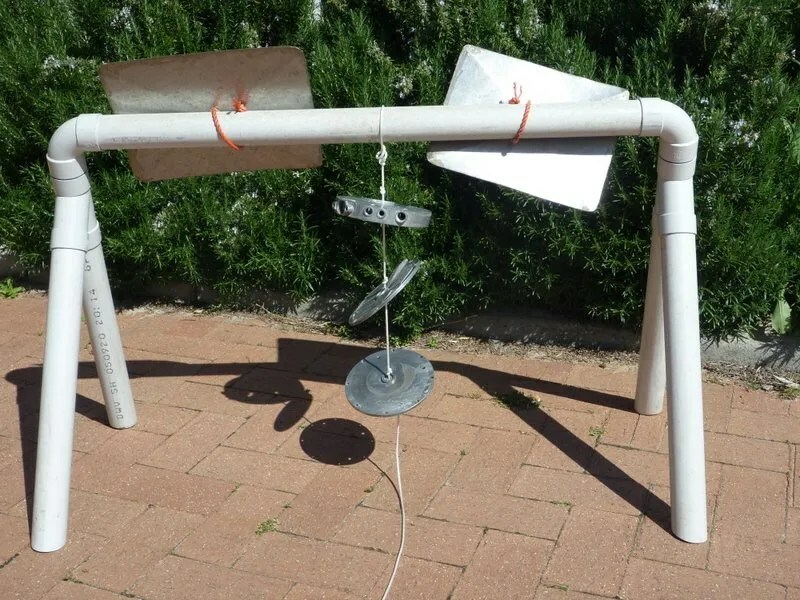 This entry was posted in Early childhood education, Music play, Musical instrument making, Outdoor play and tagged Child's Play Music, homemade musical instruments, music for children, music play, music stations, Play, PVC by Alec @ Child's Play Music. Bookmark the permalink. Great, Alec! The nested idea – making the lengths a little longer or shorter – for easier storage is genius…and something I’ve never seen/heard before. Thanks! You’re welcome, Kierna – thanks for the opportunity to share my post on your Party. This is so much fun! Boy, my kids would bang on it all day 🙂 Very creative!